Spring Lake Ranch. 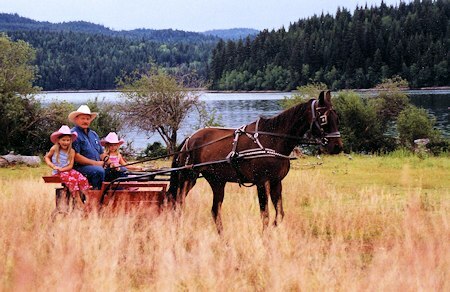 Guest Ranch & Western Vacations, Horseback Riding, South Cariboo, 100 Mile House, British Columbia, Canada. the perfect place for a tranquil adventure. Tucked in the heart of British Columbia's Cariboo Country, Spring Lake Ranch is a natural paradise surrounded by 10,000 acres of rolling forests and trails. 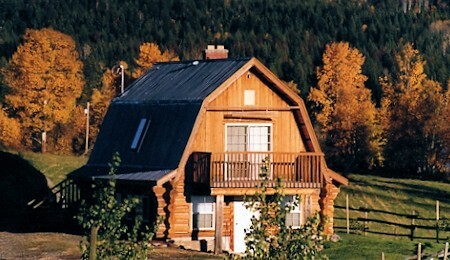 Spring Lake Ranch, near 100 Mile House, offers get-away packages that everyone can afford and enjoy -- a romantic retreat for honeymooners of all ages -- a reconnection for the whole family -- a sanctuary for business professionals -- and a special cultural program for the international guest. You are invited to experience a peaceful holiday as the guests of the Barkowsky family. 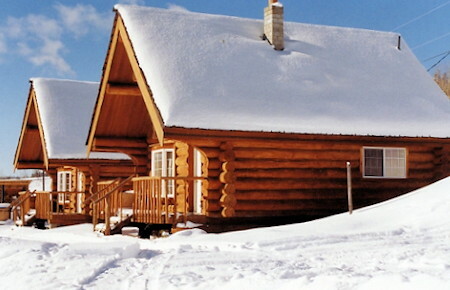 The newly finished golden coloured log cabins are nestled by your very own lake, and with a limit of twenty- four guests you are guaranteed an option of privacy or family interaction. At Spring Lake Ranch they have paid careful attention to detail and created a warm and inviting home away from home for you. You'll have the option of preparing meals in the fully equipped kitchen of your cabin, or eat a scrumptious meal prepared by your hosts in their glass wrapped dining room. At Spring Lake Ranch, most everything is homemade and meals are prepared in part from the natural goodness of the ranch. You are guaranteed to leave each meal satisfied from the love of good food, and good conversation. Year round there is something for everyone, and Spring Lake itself is a rich water resource. Visit the beaver homes, catch your first fish, enjoy sunbathing on the dock while you read a good book, or swim in one of the warmest lakes in the area. Whatever your choice, the serenity of the lake will touch your soul. 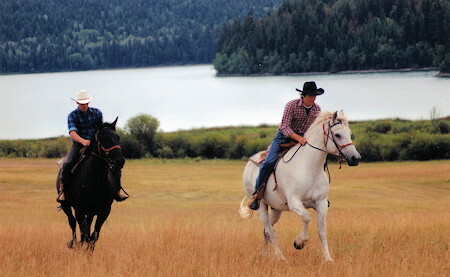 Spring Lake Ranch, in the South Cariboo, offers private trail rides with mini lessons where you are sure to see some wildlife -- 4 hour rides that include a fireside lunch - and overnight horseback trips. You can also ride the horse drawn cart and have a picnic in the meadow of wild flowers. At Spring Lake Ranch you can also take a leisurely walk through the rolling pasture fields, and hike around the lake or on the many forest trails. Surrounded by the wonders of nature, and sounds of wildlife, you will slowly find your self unwinding. In the winter months the options are endless. Set out on cross-country skis around the lake, have a game of hockey late into the evening, or go ice fishing. And who doesn't enjoy the thrill of tobogganing? 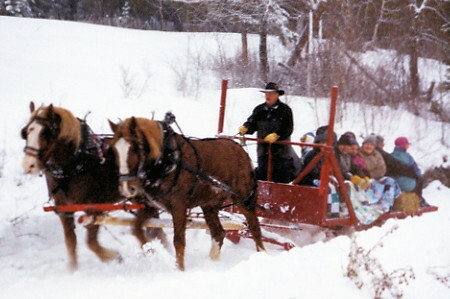 You can also rent a snowmobile to explore the trails of the ranch, or take part in a sleigh ride. Ask the Barkowsky family about a working ranch vacation. Clearing fields, getting firewood, repairing fences and buildings are never ending tasks. Morning chores, and then an afternoon canoeing or horseback riding, makes for a fun working holiday. Log building and English language lessons are also available in 6-week segments year round. Whether you enjoy horseback riding, hiking, canoeing, or fishing there is something for everyone year round. 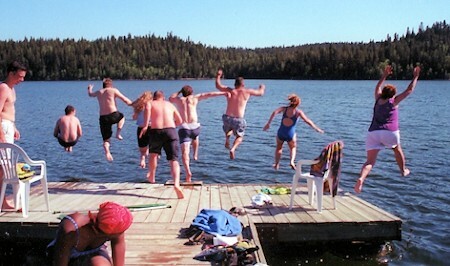 Come create a lifetime of memories at Spring Lake Ranch, near 100 Mile House in the South Cariboo region of British Columbia. Spring Lake Ranch is where you will still find old fashioned hospitality and a relaxed western atmosphere.